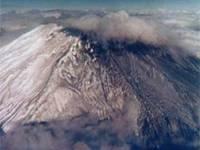 Hundreds of tiny earthquakes have been reported at Mount St. Helens, but it is unlikely they pose any hazard to anyone outside of the volcano's crater, state seismologist Tony Qamar said today. Qamar said the seismology lab at the University of Washington in Seattle is having trouble keeping up with the hundreds of tiny quakes that began Thursday and show no sign of letting up. The swarms of quakes could indicate that a small amount of magma is moving into the mountain's crater, cracking the lava dome, he said. Data from the Cascade Volcano Observatory, including gases collected by aircraft, will help scientists pin down the source of the quake swarm. Mount St. Helens erupted on May 18, 1980, leaving 57 people dead, devastating hundreds of square miles around the peak and spewing ash over much of the Northwest.